The Allies’ indifference derived from their own Judeophobia, albeit of lower grade than the Nazi variety. Mere months before World War II’s outbreak, when the Holocaust was about to be kick-started, Britain published its notorious White Paper ruling out this country as a viable asylum for refugees from Hitler’s hell. Germany’s Jews were already shorn of citizenship and fleeing, stateless, in all directions. Hitler’s threats were well recorded, shouted in the world’s face and hardly kept secret. The White Paper encompassed all the dubious goodwill the international community could reluctantly muster, lest “changes on the ground” occur that might rile Arabs in and around the Jewish homeland. Yet the fault wasn’t Britain’s alone. Hitler tauntingly invited all democracies to take his Jews, if they were so fretful about them. He knew that for all their self-righteous rhetoric, these states wouldn’t accept his provocative challenge. After 1938’s Anschluss, their representatives met in Evian-les-Bains, on Lake Geneva’s French shore, to decide what to do with Nazism’s desperate victims, pounding on their gates in search of sanctuary. They never even called them Jews, lest they incur the fuehrer’s wrath. It turned into a great Jew-rejection fest. Britain bristled at any hint of allowing refugees into Eretz Yisrael, mandated to it to administer as the Jewish National Home. Progenitors of today’s Palestinian terrorists made sure endangered Jews wouldn’t be sheltered, and His Majesty’s government appeasingly assented. The vast empty spaces of Canada, Australia and New Zealand were likewise off-limits. The American humanitarianism of Franklin Roosevelt, who unreservedly shared the predispositions of his European counterparts, consisted of tossing the undesirable hot potato into the international arena, because Jews weren’t wanted in the Land of the Free either. Indeed FDR toyed with the notion of shipping German Jews to Ethiopia or Central Africa. The UK favored the jungles of Venezuela or Central America. Mussolini changed direction northward. Instead of exposing Berlin’s urbane Jews to the rigors of the tropics, he opined that the Siberian arctic might be a preferable hardship. The motivation wasn’t much more beneficent than Hitler’s initial choice of Madagascar. These were the seeds. Once war erupted, all attempts to rescue Jews were rejected. The Allies couldn’t even be bothered to bomb the railways into Auschwitz or the crematoria therein, though they did drop leaflets at a POW camp nearby. Maddeningly, if he could peek into our reality today, a gloating Hitler would discern a world which had turned against the Jewish state in almost knee-jerk unison. The sovereign Jewish aggregate is treated like a despised pariah among the nations. The identity of both victims and perpetrators has conveniently been scrapped from history – the Jewishness of the six million and the Germanic faces of their murderers. A convenient mythology of German victimhood and lack of culpability is now the prevalent liberal theme. Holocaust atrocities were committed by indeterminate Martians called Nazis. Something bad happened about which nobody knew and for which nobody is blameworthy. Germany found itself embroiled in the unpleasantness almost incidentally. Gone from public discourse is the fiendish underside of German Jew-revulsion (the very term anti-Semitism was minted in 19th-century Germany). The Judensau (Jew-sow) was, for example, a shocking popular cultural mainstay of German religious and institutional artwork from medieval days and beyond. It’s still proudly exhibited on cathedrals, churches and public structures. Most notable is the bas relief on the Wittenberg Stadtkirche, where Martin Luther preached. 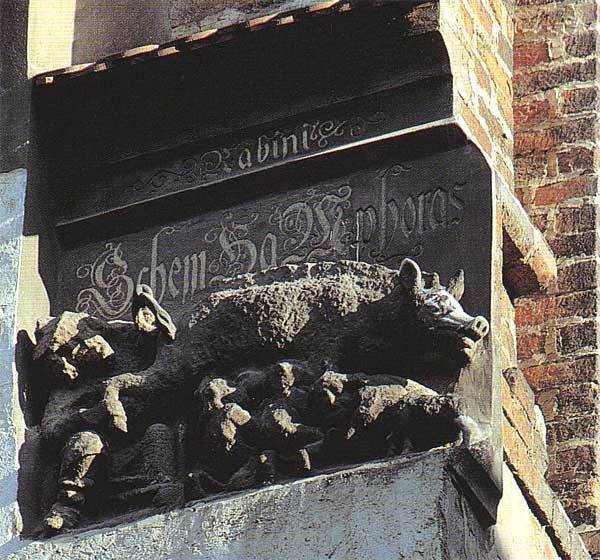 Luther himself commented: “Here on our church in Wittenberg a sow is sculpted in stone. Piglets and Jews lie suckling under her… A rabbi lifts her hind leg, holding her tail high and looking intensely under her tail and into her Talmud, as though reading something acute or extraordinary, which is certainly where they get their ShemHaMphoras [God’s explicit name, shoddily transliterated from the Hebrew].”The inscriptions above the bas relief indeed read: ShemHaMphoras and Rabini. The roots of the Holocaust are embedded deep in Germany’s psyche and cannot be explained away as mere aversion to foreigners. Analogies to Islamophobia are spurious. Jews resided in Germany from the dawn of its history and were more Germanized than Germans. They were hardly outsiders and certainly not Germany’s enemies. And yet the past is conveniently shunted aside. At the very most, Jews and Germans are viewed as players inadvertently cast in given roles as the genocide drama unfolded. These roles, we’re told, are eminently interchangeable. By universalism’s distorted yardstick, bloodstained Germany can under fortuitous circumstances transform into spotless, progressive New Germany, while Jews (whose life-affirming, justice-affirming and peace-affirming ethos is the antithesis of what Germany generated) can become the New Nazis. This has seeped into Israel’s discourse, too. Political-correctness purveyors make sure we don’t dwell on our fears of falling victim to a new genocide but that we admonish ourselves for being potential New Nazis – vis-à-vis genocidal Arabs, illegal infiltrators and even elderly Holocaust survivors. Instead of teaching our young not to count on the conscience of other nations, we inculcate in them sensitivity to the demoralizing narratives of those who slander the Jewish collective. Self-flagellating demagoguery reigns supreme among us, painting ourselves blacker than black, while absolving our enemies of any sin (foremost the inimical descendants of Nazism’s avid Arab collaborators). If Holocaust Remembrance Day obliges us to anything, it is to see the Holocaust again through Jewish eyes and resist universalism’s toxic saccharine. Otherwise, Hitler will have won. Syrupy sanctimony demonizes our national revival and simultaneously dulls our vigilance in the face of threats from Hitler’s Islamic torchbearers. The Jews of Luther and Hitler’s Germany were limited in fighting back and resisting evil. So what is Israel’s excuse now that they have a country and an army and ‘Never Again’ to stand beside ? That is only half of the story. The Germans not only murdered Jews and the 4 Einsatzkommandos kept careful records of how many men, women and children they shot every week but they also robbed them of all of their possessions, of their gold heirlooms before they were shot or gassed and of their gold caps and fillings after they had been gassed. There are enough stolen musical instruments around, from the small area of the Protektorat of Bohemia and Moravia alone, to equip a very large number of orchestras, 1,220 pianos, mostly grand, at the last count and over 20,000 violins, violas, cellos, etc. still being played on in German households. If every Jew slept in a bed that makes for 6 millionlooted beds, never mond the rest of their furniture. No offer of restitution has ever been made, Nazi mentality rules ok to this day. All true and excellent observations, but with some important subtleties and distinctions not made. The Holocaust was launched out of Germany, but Germany and German culture was nothing like the roots of the Holocaust. Adolph Hitler was not German, he was Austrian and devoutly Catholic. The Nazi party was not founded, nor did it rise out of Protestant Germany. It was founded in and grew out of Bavaria, the most Catholic part of Germany. Hitler’s “Mein Kampf” was written in a jail cell, edited by the Catholic Priest Fr. Stempfle. Hitler was in jail after a failed attempt to seize Bavaria by force in the “Beer Hall Putsch”*. Luther himself was a fanatical priest whose fanaticism imploded after going to Rome and being exposed to the flagrant degeneracy of the Papal court. It is pretty clear that his anti-semitism bought him his life and freedom when other better Protestants were burned at the stake. Muslim anti-semitism is not as old as the Catholic variety and we might well imagine that one was learned from the other. But all this is obscured anyway as you so correctly point out in the universalist notion that there are no actors in history, only ball bearings in space, banging away at each other, indifferent and waiting only for some hand of authority to bring them order. Israelis must stand up to the actors in history and their violent and baseless beliefs about Jews which are the root of hostility to Israel. And the rational world must stand with them. Europeans did to the Jews is being paid back to them. They destroyed a people who enriched the world with their brains and their culture. What do we have now? I leave that to your imagination. Among normal nations, people siding with the enemies of their country in the time of war do so in secret, afraid of being caught and court-martialled; in Israel they are brazenly flaunting their treachery for all to see and for the media to applaud. I’m a octogenarian WWII survivor, inclusive the Holocaust. I knew they didn’t get it. What is to be done? We’re not done with the story. or a small fan club. Hey, this is America: Let’s be creative!